Internet access is proving problematic in the last week, especially since I was all over western Georgia. Uploading pictures is not easy either, but I did get some good photos north of Zugdidi, in Poti naval base, in the tank base in Gori, and near Senaki. I am now in the north east of the country, in the town of Telavi, Georgian wine country. I have tonnes of photos taken, I hope to upload some soon. 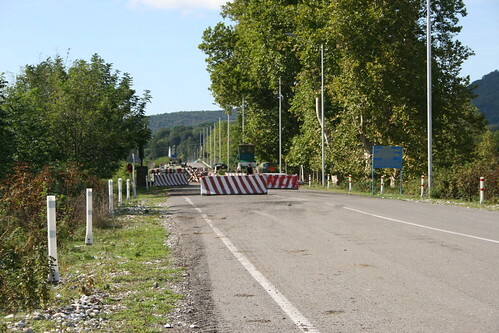 And the border of the Russian buffer zone, about 3km north of Zugdidi. You can make out an armoured vehicle on the right. There was no international presence near Zugdidi or at the border post. I was told Russia is trying to force the people in the occupied town of Gali to take Russian passports. It’s been a safe trip mostly. 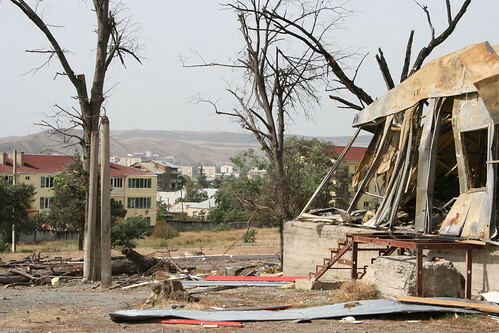 Though Ossetian fighters attacked Turkish road builders between Tbilisi and Gori on Wednesday. 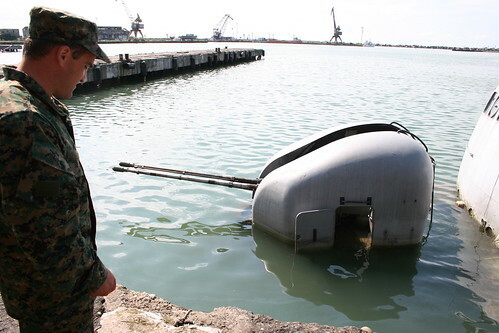 And we nearly got arrested near Abkhazia, more of that anon. More when I get reliable internet and some time!